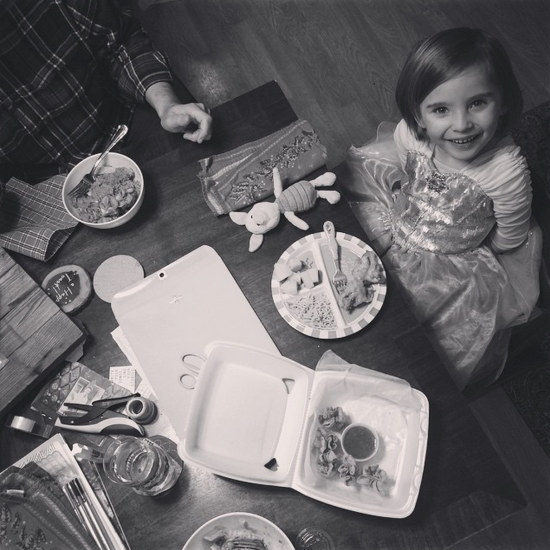 Instagram caption read: "It may be takeout in the midst of a mess, but it's still my little family together around the table sharing about our day and annoying each other and laughing and singing along with Johnny Cash." Because I want to sit at the table more. Because I want to invite in more joy. Because I want to keep things simple when that will bring in more ease. Because there can be beautiful, real, true, for-the-scrapbook moments even when the house is cluttered and you're eating amidst a current creative project. Because judging myself does not create space for more joy. Because noticing these moments invites in more light. Because look at that smile.